This is a phrase that always annoyed me when my mother would speak frankly to me, especially after I had crossed her. To me it said “Listen and don’t talk back,” or “Shut your pie hole and listen up.” Actually, as a parent, I’ve been guilty of using the same terminology. How effective is this mode of communication? First of all, that salutation to “Listen Here,” is always preceded by situations of conflict. It announces in living color, that it is MY turn to talk (if we were in fact taking turns) or that what I have to say is more important than what you have to say. Often this type of interaction is hierarchized by authority or reporting protocols, such as the thought “I am the President darn it”-or harsher terminology. Those in command often feel they have a right to be heard louder that those who don’t. We ALL misspeak at times. We ALL say words that we wish could be recalled. We all wish we could rewind and repeat in a different way. But that’s not how life is. What we can control is our ability to listen more carefully, and strive to articulate in a way that doesn’t offer up a reason to take offense. Perhaps these tips well help all of us in our conversations. Let’s make them all uplifting as we strive to build our trust with those we work with and serve. I was on a business trip to Portland- an area I find lovely (both the people and the landscape) and enjoy spending time there. While awaiting an airplane in Portland, I was attracted to a wonderful sound. 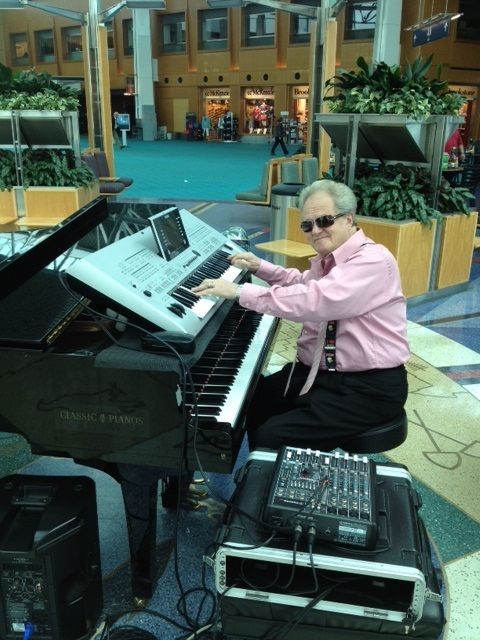 I watched this gentleman, Lee Nicholas, play a nice blend of jazz-symphony-light rock on his electronic pianos near a sitting area in the airport lobby before entering security. He had a gig going for some time as I watched people from many nations take his picture, listen, get closer, and finally put some money into his jar to show appreciation for sharing his talents. We grabbed a chair as our daily stresses left and a smile creased across our faces. The obviousness of his love for what he was doing made all the difference. He could have been playing a wash board in a tub and it would have been effective with that infectious grin. I had a chat with Lee who, many years ago, was on a touring gig to many Holiday Inns in the states- even my home state of Colorado. I knew he wasn’t blowing smoke when he mentioned establishments in my town that would not be known to a fabricator of stories. Folks in that era would come into the bar/dance/lobby to enjoy their conversations, romances, stories of the road, and even a dance or two while the background music was provided by Lee and his band. This is the type of entertainment that likely was not coined as a “concert,” but provided a meaningful backdrop to an otherwise boring evening. Imagine the nice revery that was created for many after the long day of work or travel on the road. What a wonderful addition at the close of their day. Perhaps such is the life of an artist. They work at their craft and create, out of their hearts and minds, visions which are then rendered on canvas, cut from stone, or rendered through a musical medium. Put out to the universe, so to speak, until someone stops in their tracks and admires with great appreciation that which was or is being created. I have several paintings on my walls that confirm such a notion. How he ended up at the Portland airport in a somewhat permanent gig I didn’t discover. I assume “love” brought him there. What I really appreciated was that now, even in his mature years, he was doing something he loved. Something that provided a meaningful experience to those he unknowingly served. What a wonderful example of living your passion and making your mark. I bet Lee wasn’t super rich (you don’t see Bruce Springsteen doing airport gigs) but Lee was as rich as any other artist because he loved what he was doing and he was making a difference. You could never gage his worth by the money in the glass jar on his piano, but he provided for us that day a little something of just what we needed. I put an extra bit of money in his jar and bought his CD- of which all the tracks are written by him. I’m listening to it as I wrap this up. Long live the artists who give of themselves so that our lives may be enriched.